After it was all said and done, the Tri-Cities Road Club donated race proceeds to help fund the local National Interscholastic Cycling Association (NICA) mountain bike teams. The local teams(Science Hill High School Team and North East Tennessee Cycling Team composite) are beginning their second season of competition this Fall, and will compete in races for 6th-12th grade. Teams will travel as far away as Memphis to compete in Tennessee NICA League races. In the news: Johnson City Press Articles! Read more at Johnson City Press online. The last day of the Blue Plum is unchanged from last year. Thursday night the Johnson City Commission permited the road closure for the final event of the Sweet Water IPA Omniun. On Sunday June 5, the race will run the same course closure as last year. The restaurants will be open so some of the race spectators will be dinning on the side walks while watching the race as they did last year. The Omnium’s final event, the Fountain Square Criterium, will use the closed downtown roads as an exciting eight turn race course for all levels of amateurs and professional bicycle racers throughout the southeast. The Omnium’s level of competition is such that many of it’s past winners have raced the next year in international races, including the Tour de France. The Sweet Water IPA Omnium is a three race competition with a total purse of $13,100. It includes the Saturday June 4 Nor-Well Roan Groan with seven separate fields starting in Elizabethton and finishing at Carvers Gap. The Italian professionals that raced the Roan Groan last year said it was very similar the the mountains in the Giro d’Italia. The Roan Groan is followed by the Tupleo Honey Time Trial on Saturday evening, in Erwin. Last year, Alfredo Balloni of Amore & Vita- USA Racing was fastest by four tenths of a second. Balloni finished 6th a few weeks later in the Italian National Championship Time Trial. On Sunday the Fountain Square Criterium has seven different races for amateurs beginning at 8am followed by a kids fun race at 1:25 pm for riders 10 and under. At 1:50pm the Pro/Am women race 40 minutes followed at 3:00pm with the Pro/Am men racing 90 minutes. Last year’s close competition for the Omnium winner for the Pro women and men will be continued this year. Nolan Tankersley of Erwin, last years winner, has begun 2016 as a first year professional riding for Lupus Racing. His team has said he will return with teammates to defend his win. Ian Garrison of Decatur, GA, who finished second after being tied for first before the Criterium, will try to beat Tankersley this year. Last year’s winner Debbie Milne of Greenville, SC was four points behind Sarah Matchett of Davidson, NC, going into the Criterium, but won the Omnium by finishing second in the Criterium. Professional, Elite masters, and other amateurs racers will return to the Tri Cities to challenge the local terain and each other June 6 and 7. Sanctioned by USA Cycling the Slow Ride Omnuim brings the international sport of bicycle racing to Carter, Unicoi, and Washington Counties. Sponsorship by New Belgin Slow Ride, Franklin Woods Community Hospital, Tennessee Donate Life, Tupleo Honey Cafe, and Carter County Tourism has provided a purse of $12,000 for the event. The prize list will continue to draw the high level of competition the spectators have learned to expecet for this event. The first race, Carter County Roan Groan, begins at 9:00 am Saturday June 6 at Cat Island Park, Elizabethton. 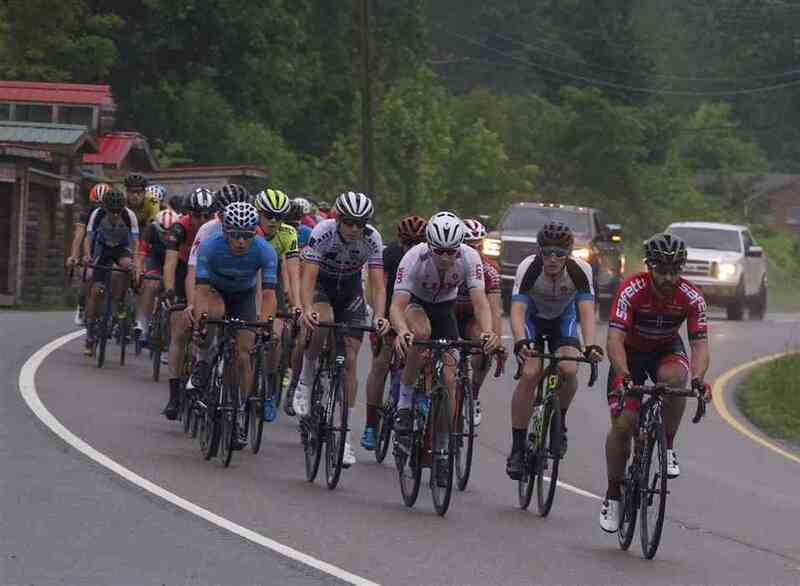 The profesional cyclist will compete on an 85 mile course through Carter and Unicoi Counties. Their finish will be at Carvers Gap after a category 1 climb of 7.25 miles. All the amateur categories will also finish at Carvers Gap after racing either 50 or 30 miles. This unique East Coast, mountain top finish brings racers from throughout the nation including previous Tour of Italy participants. The second race Saturday at 5:30 pm is the Tupleo Honey Time Trial. It starts in Erwin on Temple Hill Road and goes 3.1 miles into Unicoi County. The close competition last year had the first and second place finishers separated by less than one tenth of a second on a course with a one mile climb. After gathering points for the Slow Ride Omnuim in the first two races, the final chance to win points in the three-stage race is the Franklin Woods Community Hospital Criterium on Blue Plum Sunday, June 7. Races begin at 8:00 am with the professional race beginning at 2:30 pm. Some riders will be vying to win the criterium race while others will be racing strategically for the Omnium win. The high speeds and closeness to the spectators gets the crowds excited, which in turn motivates the racers. Some people come for the food at on course restaurants but then get fully involved in the races. Main Street Pizza, Labels, and Tipton Street Pub have outdoor seating on the race course. The race is also visible from Tupleo Honey Cafe’s outdoor seating. Just before the Pro race the Blue Pedal Kids Fun Ride will give age 10 and under kids an opportunity to ride the same course as the professionals and it’s for free! Kids Race riders will become our future Olympians? Over 300 professional and amateur bicycle racers will compete this weekend in the Johnson City Omnium. Early registration includes eight current Tennessee Bicycle All Round (TBAR) Champions. This includes all of the senior women state champions are entered. Amanda Ragle from Brentwood, the category 1-2 champion, will be competing against Stephanie Rynas from Chattanooga. Rynas moved up from being the category 3 champion to category 2. Rachel Hart from Hendersonville, the category 4 champion, has moved up to category 3. Morgan Miller from Charleston, is the Junior women 17-18 champion and will be racing in the senior category 4 women’s race. Ragle, the highest ranked national rider has not raced in the Johnson City Omnium. There will also be a strong competition in the men’s Elite Masters races. Dirk Pohlmann from Knoxville, is the Pro 1 TBAR champion. He started racing in 1988 and turned professional in 1993. He retired from racing as a professional in 1997. In 2005 he started racing in the masters categories as well as the category 1 races. In 2007 Pohlmann won the National Championship’s Masters 40-44 Road Race. Pohlmann has raced the Johnson City Omnium many times but always in the Pro 1-2 races including a fourth place finish last year. This year he will race in the Elite Master field. The Elite Masters, for 35+ masters who are categorized as 1,2 or 3, is in it’s second year, . The current TBAR Elite Masters champion is Brad Price from Blountville. Pohlmann and Price have never competed against each other, since up to now they have raced in different categories. Last year Price finished second in a three man sprint finish of the Roan Groan in the 30 mile Elite Masters field; Pohlmann finished eighth just 4 minutes behind the winner of the 55 mile Pro/1 winner of the Roan Groan. Pohlmann has won the omnium in the past, but never the Roan Groan. He is highly motivated for a win on the mountain. In the Masters50+, Tony Adair and James Mead will fight it out for the top omnium position. Adair, from Murfreesboro, is the TBAR 50+ champion. He finished second to Mead from Davidson, NC last year in the JC Omnium. Adair got first in the time trial and second in the road race and criterium while Mead got first in the road race and criterium and second in the time trial. Mead was 59 seconds faster on the 30 mile, mountain top finish and Adair was 18 seconds faster in the 3 mile time trial. The Pro 1-2 Omnium will again be the fastest and most competitive in Tennessee. This year it will include two nineteen year old rivals – Nolan Tankersley, from Erwin, who has risen to the top amateur category 1 and Andrew Bailey, from Piney Flats, who has risen to category 2. Previously in their head to head races Tankersley has finished ahead of Bailey. In the two local training races by the Tri Cities Road Club this May, Bailey has won but Tankersley was not entered. Bailey’s recent race experience on a technical criterium course might favor him in this local rivalry. The Tupelo Honey Roan Groan begins in Elizabethton Saturday morning with the first of seven groups racing off at 9:00am. Just before the start, there will be a presentation to Gary Nave, of Nor-Well, for his 30 years of unwavering sponsorship. Larry Rosilina will be recognized for riding in the most Roan Groan competitions – seventeen and Rachel Monderer for riding in seven women’s Roan Groan competitions. The second event, the Tupleo Honey Time Trial, starts at 5:00pm Saturday on Temple Hill Road in Erwin. The Temple Rd runs along side of I-26. Riders will start individually every 30 seconds. Time trial points will be added to road race points for omnium placement. 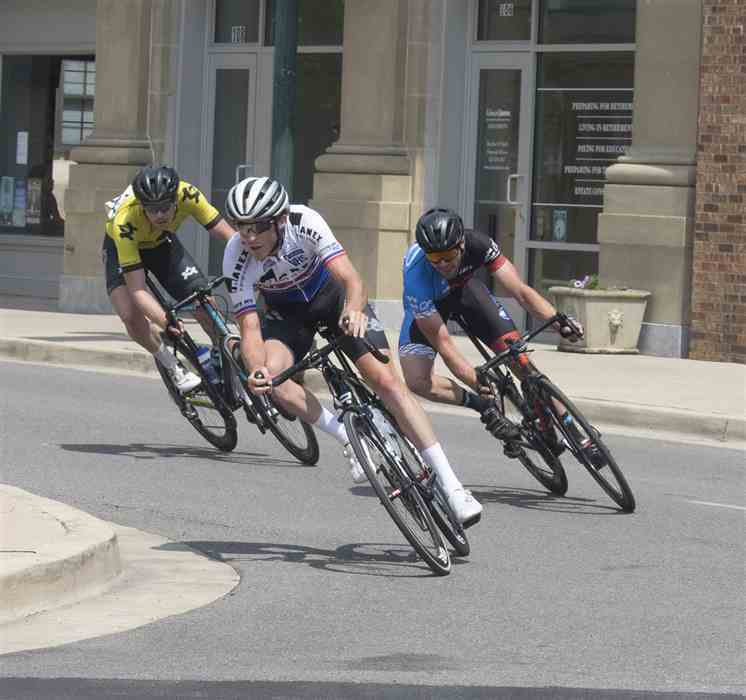 The final event, the Franklin Woods Community Hospital Criterium, will be the last chance to add points to determine the Johnson City Omnium winners in each category. 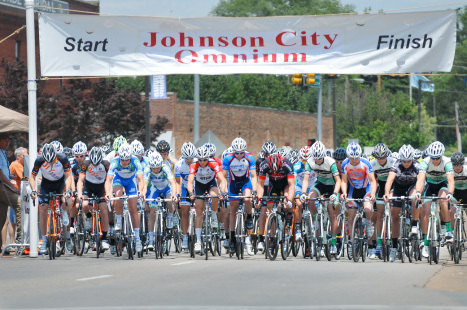 The first race in downtown Johnson City will be the Juniors at 8:00am. They will be followed by the Masters 40+, 50+, 60+ at 8:30. The Elite Masters will start at 11:35. The Tupleo Honey Kids Fun Race, for kids 3 to 9 years old, runs one lap of the race course at 2:10pm, just before the Pro 1-2 race. At 2:30pm the main event of the Pro 1-2 racers will race for one hour to complete their race weekend and finalize their share of the over $12,000 cash. The sponsors that make all this possible are: Franklin Woods Community Hospital, Tupleo Honey Cafe, Donate Life Tennessee, Nor-Well, Renasant Bank, Northeast State, Holiday Inn, WCYB News 5, Carter County Tourism and Earth Fare. 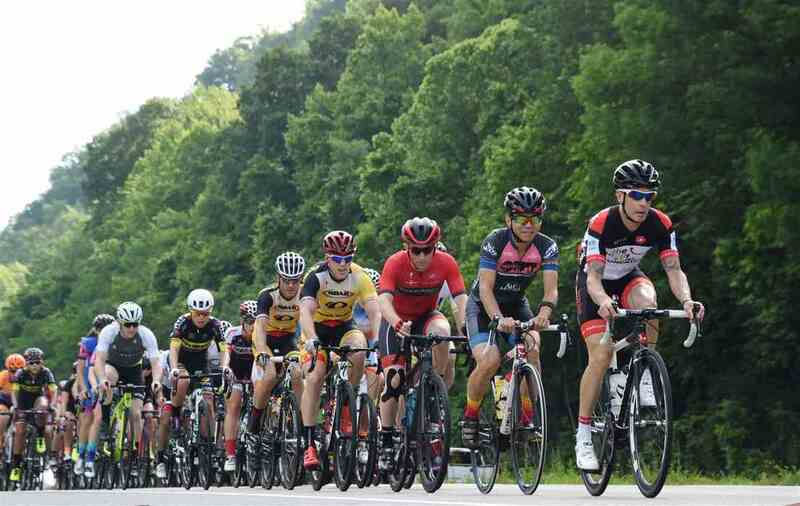 JOHNSON CITY — The Johnson City Omnium will return June 7-8 to its popular and proven courses. On June 7 the 30th Roan Groan will have 400 or more cyclist measure themselves against each other and Roan Mountain. It is part of the June 7 and 8 Johnson City Omnium. The race will be ridden by first time racers as well as professionals who will be competing for their share of the over $12,000 purse. The JC Omnium included the Roan Groan as the road race component beginning in 2006, though the Roan Groan was begun in 1985. Since it’s beginning, it has been sponsored every year by Nor-Well. Gary Nave of Nor-Well sponsored the first sanctioning of a previously informal race up Roan Mountain and his 30-year commitment has made it possible for the Groan to become the oldest continuous sanctioned race in Tennessee. Rex Martin, formerly of Johnson City who now lives in Davenport, Florida, has participated every year for the last eight years in the Roan Groan. He raced a total of 12 of the last 29 Roan Groans. Larry Rosolina from Hampton Tennessee has raced the Roan Groan 16 times. The Tupelo Honey Roan Groan will start at Cat Island Park in Elizabethton at 9:00am with the professional 1,2 category, the first of seven groups. The first three groups will follow a 55 mile course, finishing with the 7.25 mile climb up Roan Mountain. The other four groups will take a shorter 30 mile course with the same finish climb. The racers will effect but not stop the vehicle traffic on 19 E, Simerley Creek, Route 107, Sciota Rd, Dry Creek, Gap Creek and Route 143. That afternoon the same racers will compete individually against the clock in the Tupelo Honey Time Trial on Temple Hill Road in Erwin. The Time Trial will start at 5:00pm with the last racer off about 7:30pm. The JC Omnium’s high level of competition is due the following sponsors: Franklin Woods Community Hospital, Tupleo Honey Café, Donate Life Tennessee, Nor-Well, Northeast State, Renasant Bank,Holiday Inn and WCYB News 5. The Johnson City Omnium the premier bicycle race in Tennessee begins Saturday. The pre-registered racers hometowns are in Hawaii, Michigan, Massachusetts, Florida and other states. Most racers are coming from Tennessee, North Carolina and South Carolina. In only seven years the JC Omnium is recognized as one of the best races in the Southeast; it’s the only one with a mountaintop finish rivaling the Tour de France mountaintop finishes. Jeff McGrane, five time Tennessee Champion said “The Roan Groan road race is a truly unique and challenging event that draws racers from across the country, and the criterium on Sunday is a family friendly event that is among the most technically challenging out there.” It is part of the Tennessee Championship series at the top division I level with maximum points available. The JC Omnium is comprised of the twenty-ninth running of the Nor-Well Roan Groan, the Temple Hill Time Trial, and Franklin Woods Community Hospital Criterium. Each individual event has cash prizes along with combined results cash prizes. This year the total is over $11,000. In the Roan Groan, one of the local Tri Cities Road Club riders, Michael Walters, has made it a goal to be the mountaintop winner of the Masters 40+ field. Walters said (I) “really want to win it badly for the home riders”. He is the current Tennessee Road Race Champion and has been training on Roan Mountain for this race. His time for the 7.5-mile climb is 37-½ minutes, which is unofficially 1-½ minutes faster than the fastest local time. The Pro 1-2 field includes the 2009 Omnium winner John DeLong, u-neak DESIGNS, and the 2011 winner Brian Sheedy, Giant Factory, Brevard College. Sheedy focused on cyclocross racing last year and didn’t compete in the JC Omnium. His efforts paid off with a silver medal in the World Cyclocross Chanpionship. Sheedy and DeLong will have strong competition from Shawn Gravois, United Healthcare of Georgia, who finished fourth last year. DeLong and Sheedy are competing without any teammates while Gravois has two teammates to help. Though teams can control the criterium on Sunday, the Roan Groan and Time Trial are won on individual effort. Riders without team support have won the last two years. This is the first year with a change in the master’s categories. Previously master riders were divided by age only but not ability. The new category of Elite Masters is for the over 30 year old top Pro 1-2s. That reconfigured the Masters 40+, 50+ and 60+ to have the category 3,4,5 racers in their fields. The new structure makes the competition more even increases the participation in all master categories. By pulling the very top riders out of the 40+ categories, they all now compete in the Elite Masters. The Elite Master’s category now contains three of last years Omnium winners, Brad Swope, Texas Roadhouse Cycling, won Masters 60+, Hugh Moran Industry Nine Cycling, won Masters 40+ and Erik Ostergard, Industry Nine Cycling, won the Masters 30+. Each has at least one team member for support. Racing in the Elite Masters is Vice President of Operations for Bristol Regional Medical Center, Brad Price, Chain Heart Studio. Price is the current Tennessee Road Champion. He has had two wins, a second and a third in the Elite Masters this year. The competition in the Elite Master’s category will be exciting!. The final event of the Omnium, the Franklin Woods Community Hospital Criterium, will be in Downtown Johnson City. 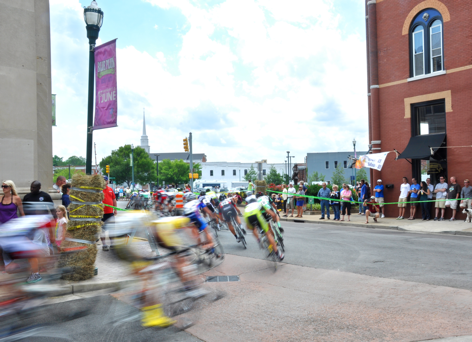 The Criterium is an exciting spectator race – and it’s free to the public. The strategy of each rider and team will develop as they vie for the criterium placings or Omnium placings or Tennessee Championship series points. The Criterium starts at 8:00am with amateur categories. The Elite Masters race begins at 11:35 and the Pro’s race at 2:30pm. The Johnson City Omnium, June 8 & 9, is drawing the Tennessee State Champions and the top bicycle racers in the Southeast. Nine of the Ten 2012 Best All Round Tennessee Champions competed in the JC Omnium last year and they have started to register for this year’s race. The racers have designated this race as the premier cycling event in Tennessee. Jeff McGrane, the Category 2 State Champion said the Nor-Well Roan Groan Road Race is a truly unique and challenging event that draws racers from across the country, and the Franklin Woods Community Hospital Criterium on Sunday is a family friendly event that is among the most technically challenging out there. 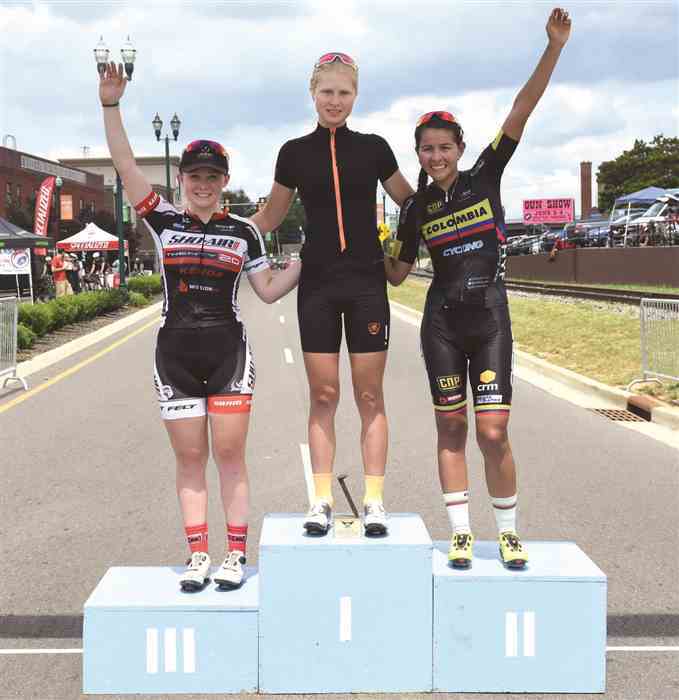 For the first time a local racer won one of the Omnium categories last year. Seventeen year old Nolan Tankersley from Erwin riding for Tri Cities Road Club, won the Category 3 Omnium. He has registered as a Category 2 and will be competing against the pros this year. Moving up to more competitive racing is the norm for top finishers in the JC Omnium. Past winners have gone on to compete in the Tour de France. Two other local Tennessee Road Race Champions have also registered. Brad Price, Vice President of Operations for Bristol Regional Medical Center and racing for Chain Hart Studios, won the 30+ Road Race Championship, and will be racing against last years 30+ Omnium winner Hugh Moran racing for Industry Nine Cycling. Price has won two first, one second, and one third in competition so far this year. He is in excellent condition to be the first local Omnium winner in the 30+ category. Mike Walters from Johnson City, racing for Tri Cities Road Club, is the 40+ Road Race Champion and said “I have decided to focus on Roan for this year, really want to win it badly for the home riders”. The new categories for the masters racing in Tennessee this year should help his chances. The Nor-Well Roan Groan will have the first of seven groups start at Cat Island Park in Elizabethton at 9:00am Saturday June 8 and finish in Carvers Gap after racing 55 miles and climbing 5775 feet. The racers will, after a short rest and meal, race the Temple Hill Time Trial in Erwin, starting at 5:00pm. 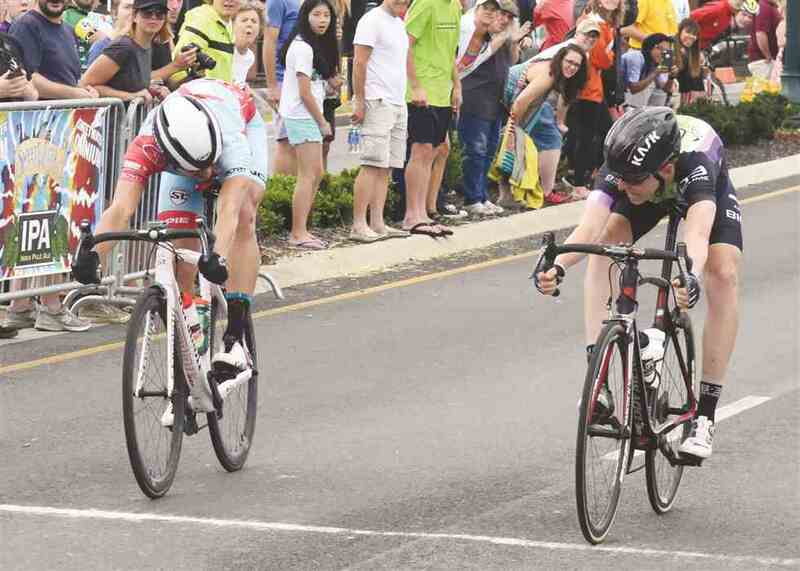 On Sunday the Franklin Woods Community Hospital Criterium will challenge the racers with its technical course in Downtown Johnson City with the Blue Plum Festival. Spectators will bring their chairs and line the sidewalks or sit in the downtown restaurants to watch the events. The first amateur race begins at 8:00am with different categories throughout the day. Of special interest is the Kids Fun Race for 3 to 9 year olds at 2:15pm. Their registration is on site and free with parental signature. It immediately precedes the Pro 1-2 race at 2:30pm where a field of 80 to 100 top-level racers will compete in the final event of the Omnium. Last year’s Omnium winner, Robert Sweeting racing for 5 Hour Energy, just finished the Tour of California against seven Professional World Champions and eleven current Professional National Champions from all over the World. Registration is open. Go to http://www.pcpomni.wordpress.com for detail information and link to registration. The Johnson City Omnium will be June 8-9, 2013. It continues the three-race event inthe Tri Cities of East Tennessee that have been presented by the Tri Cities Road Club since 2006. One change for 2013 is the finish of the Roan Groan. It will not climb the additional1.75 miles to the Roan Mountain Gardens but finish as in the past in Carvers Gap. The Pisgah National Forest permit cost would be over $2000 and we are not able to get additional sponsorship to cover it. There will still be the 7.5 miles climb averaging 7% to the finish at Carvers Gap. This will be the 28th edition of the Roan Groan. Also added this year will be a vehicle to transport a bag of descending clothing. Return to Elizabethton will still be the responsibility of the racers. miles with a 1mile climb at 4.0% average and a 6.7% decent for 0.5 mile. The Criterium is slightly changed by continuing up Buffalo St. to Roan St. instead of going down Market St. This removes one turn but none of the tight corners. The Blue Plum food court will remain on Market St and music at the stage on Main Colonial Dr. There will be a separate field for Women Category 4 in the Criterium. the Omnium will have different master categories. They will be the Elite Masters 30+category 1,2,3; the Masters 40+ category 3,4,5; the Masters 50+ category 3,4,5; and the Masters 60+ category 3,4,5.